14,000’ is the view and perspective from the ‘top of the mountain.’ (In the Rockies, they’re called ‘fourteeners.’) At this altitude, the air is thinner and the raptors soar. If 30,000’ is about vision, 14,000’ is about focus. A place to talk about Business Models and Strategy, but most importantly, a place to finding clarity around Priorities. 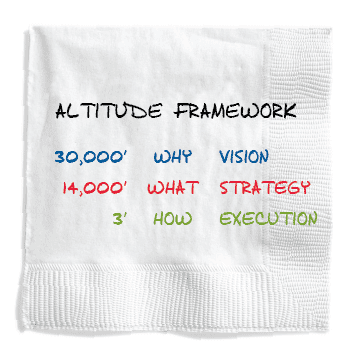 One of our favorite devices for simplifying your message at 14,000’ is The Rule of 3. The Rule of 3 is a magical rule for SIMPLICITY. As human beings, we’re wired to understand, internalize, and remember threes. Politicians know this, as does the media. Neuroscience tells us that the brain actually finds harmony in threes. Not only is Three just right (thank you, Goldilocks) but anything more than three is too complex! Barry Schwartz’s The Paradox of Choice: Why More is Less tells us stories of engagement DECREASING proportionate to MORE choice. Three-Act Plays. The first act sets up the story, the second act creates conflict, and the third act is the resolution.The Holy Trinity. Pyramids. An ancient symbol for strength. Action: Take the time to write out everything you do on one or two sheets of paper. 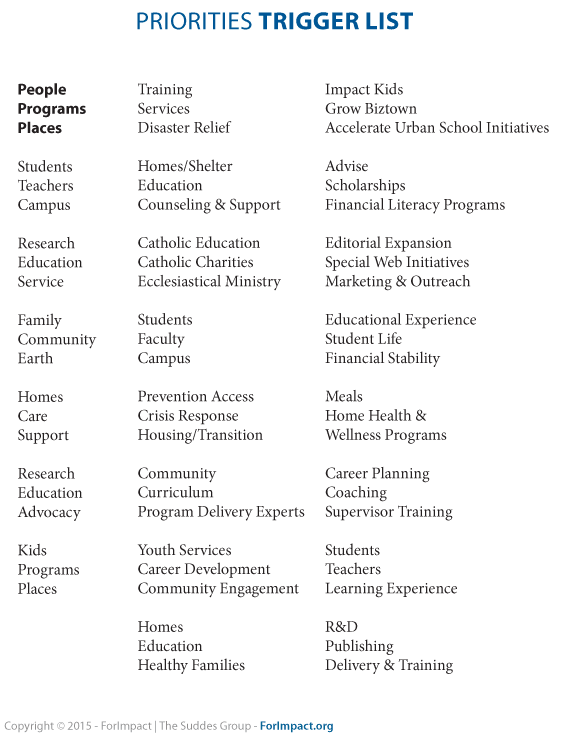 Then use the attached trigger list to simplify your programs and funding needs into 3 Priorities.